Take a deep breath and exhale, the view was so spectacular and panoramic only a painting could express it. I painted on the side of the creek as night began to fall I heard flute music from across the creek and there in the setting sun a wedding was taking place on a rock in the middle of the creek. How totally breath taking that moment was. Oak Creek is a plien air painting done in oil. It is 10x12 done on RayMar canvas on cardboard ready to frame. A hard wind was blowing the day I painted Red Rock. I stood contemplating where to get a good view and still not have my canvas end up down the moutain somewhere and then I realized it didn't matter it all was spectacular. I decided to paint an urban landscape today. Something a little different from what I have been painting for my painting a day today. It is done in watercolor. 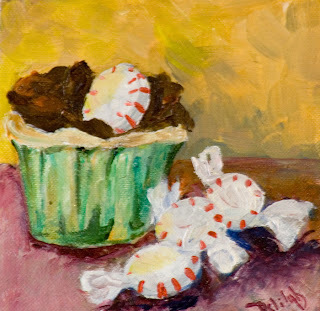 Painting a day Chocolate Frosting and Mints all on top of a yummy cupcake. Cupcakes are such fun they seem to represent a party. So when I think of cupcakes I think of fun events that are simple and fun. Holiday Cupcakes all dressed up for the day.This painting is done on gallery wrapped canvas with painted sides. It is wired and ready to hang. This painting is for sale on my e'bay store. The painting has a fixed price of $100.00 for immediate purchase ( no bidding against anyone else ). 7x5 oil on hardboard framed.This painting is framed and ready to hang. This painting is available at my E'bay store. Each painting in the store is for sale at a fixed price for immediate purchase; no bidding against anyone else. This Plien Air painting was done at Long Lake. I went to my cottage at Long Lake and decided to do a small Plien Air Painting on a very cold day this Friday after Thanksgiving. I'm sure it was much more fun then shopping. A tree fell on my cottage this fall and I am still doing repairs. I currently have no electric there and so no heat. It was really a cold day for painting but I enjoyed the sun when it peeked out. 8x10 oil on hardboard ready to frame. Oil on gallery wrapped stretched canvas with painted sides. This painting is wired and ready to hang or it can be framed if you like. F is for fruit, two red pears waiting to be eatenor given as a gift.Wired and ready to hang or this painting can be framed. It is done in oil on gallery wrapped stretched canvas with painted sides. From today until the 15 of December 2007 any painting can be shipped directly to the person you would like to give it to at no extra cost. A lovely card will be included with your gift message. E is for Eggplant. Eggplant,tomatoes,and a green bean some great vegetables for a daily painting. I love Eggplant. When I was a little girl my great grandfather would plant eggplant just for me. Now you know I was always a little crazy. At the age of four I was in love with the shape and dark purple almost black color of the vegetable. Who's says, kids don't like there vegetables? 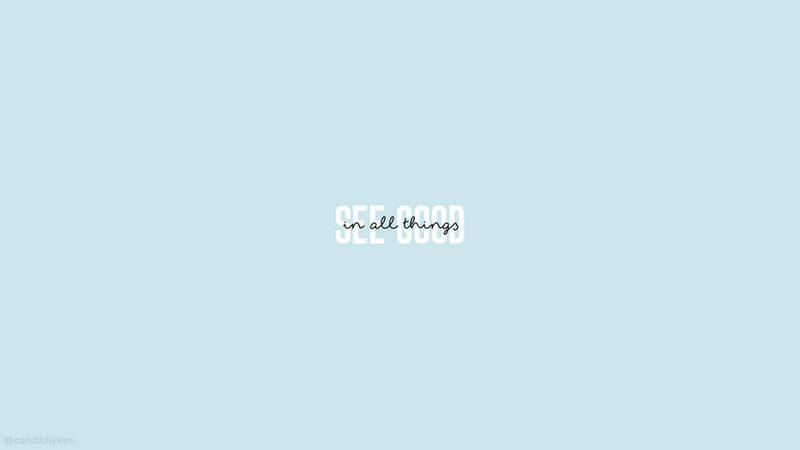 I love this one. Daily painting number 219. D is for Desert a yummy cupcake with strawberries on it. This little yummy is 6x6x1 1/2 it wired and ready to hang or it can be framed. 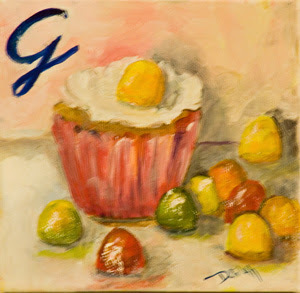 This is the newest painting of cupcakes and also another in my Alphabet series of kitchen art. C is for Cupcake.This is new for my alphabet series and also another one of cupcakes. I have done several cupcake paintings and find something new to do each time I do one.This painting is 6x12x1 1/2 on stretched gallery wrapped canvas. It is wired and can be hung as is or framed if you like. Red beets, the Romans used beetroot as a treatment for fevers. In Roman times beet juice was consider an Aphrodisiac. Field Marshall Montgomery is reported to have told his troops to "to take favors in the beetroot fields" a euphemism for visiting prostitutes. This painting is 12x6x1 1/2 on gallery wrapped canvas with painted sides. It is wired and ready to hang. B is for Beets is the second in my alphabet series of kitchen art. This oil painting is done on gallery wrapped stretched canvas. I have used cadmium red, alizarin crimson, phthalo green, raw umber, cadmium yellow and ultamarin blue. 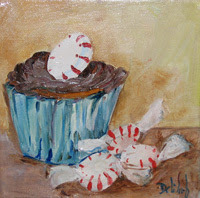 The painting is 6x6x 1 1/2 and is the newest painting in my cupcake series. It is number 215 in my painting of the day series. A is for apple the first oil painting in my alphabet kitchen series. It is 6x6x 1 1/2 on gallery wrapped stretched canvas wired and ready to hang. This small painting makes a great gift. 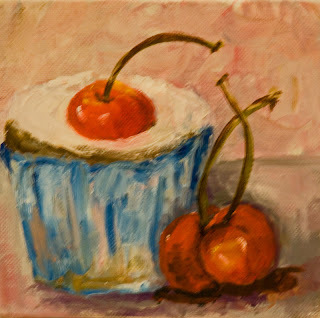 Cupcake and Cherries is done on gallery wrapped canvas with painted sides. It is wired and ready to hang as is or it can be framed. Start the Holidays with a make we merry drink. 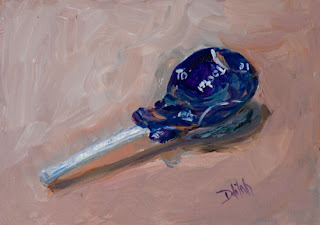 Grape Tootsie Pop 5x7 oil on hard board. This painting will be shipped flat and carefully package to you. 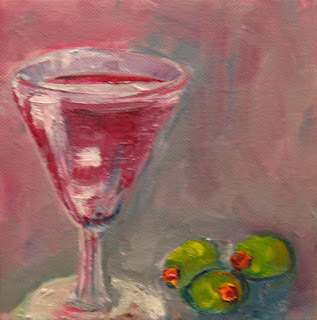 Raspberry Martini oil on gallery wrapped stretched canvas wired and ready to hang. This painting is 6x6x1 1/2 on stretched gallery wrapped canvas. Fresh Hatched fuzzy baby chicken wobbles across the canvas done in oil it is 8x6x1 1/2 oil on gallery wrapped stretched canvas with painted sides. This painting is wired and ready to hang. 6x8x1 1/2 oil on gallery wrapped stretched canvas,wired and ready to hang. It is 9x12. The colors are passionate I am playful with the subject and am trying to give the work a dreamy abstract look. Last Rose of the summer is done in oil on stretched canvas. It is 10x8 with staple free sides. Autumn Colors the oil painting is done on hardboard and is ready to frame.The aspen were in bright color on my recent visit to Arizona so if you like texture this is a great painting for you. Red Poppies oil painting 16x12. Red Apples 5x7 oil on hardboard ready to frame. Red hard candy coated M and M's oil on hardboard 5x7. Blue and Green crayons done in oil. This painting is 5x7 oil on hardboard ready to frame.